Salt Lake City, Utah – February 6, 2003 – Holiday Expeditions in association with the non-profit environmental organization Living Rivers has announced a special river trip June 2-6, 2003 to commemorate the start of this era’s river conservation movement. 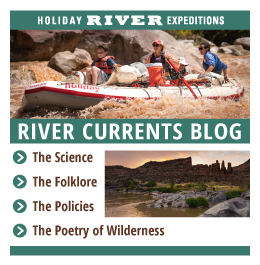 In June of 1953 Living Rivers’ co-founder, the late David R. Brower, launched modern-day river advocacy with a trip down the Yampa and Green Rivers in Dinosaur National Monument. His objective, which was achieved, was to raise awareness to defeat the proposed Echo Park Dam and to save the Monument from inundation. The public is invited to join a collection of leading activists and noted authors and naturalists who will openly share their river knowledge, stories, and viewpoints on a five-day journey on the Yampa and Green Rivers through Dinosaur National Monument. The trip is limited to just 25 participants and the cost is $1000, equipment, guides and meals included. Providing logistical support for the expedition will be Dee and Sue Holladay, founders of Holiday Expeditions. Since launching their business in 1965, they have completed hundreds of river trips in Dinosaur and throughout the West. They will share their intimate knowledge of the human and natural history of Dinosaur National Monument on various off-river hikes to places of significant interest. Also along will be Dr. Roderick Nash, who wrote the conservation classic “Wilderness and the American Mind”. Dr. Nash will row his beautiful wood dory through the towering sandstone cliffs of the Yampa River. The most remarkable cliff face is called Tiger Wall, where tapestries of desert varnish color the surface like the fur of a Bengal tiger. 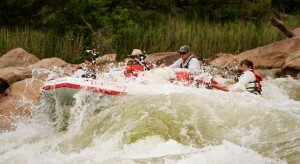 Legendary Colorado River boatman and professional river guide Kim Crumbo will be present as well. Crumbo is a passionate advocate of wilderness protection for the river corridors of the Colorado River basin. He is also a respected historian and naturalist, and the author of an excellent river guide that focuses on the human history of the Grand Canyon. John Weisheit is the trip leader of this expedition and another long-time river guide of the Colorado, and a strong advocate for a free-flowing Green River. He has co-authored a book about the Colorado River in Canyonlands National Park, which will be issued soon by the University of California at Berkeley. The Waterkeeper Alliance recently designated John as the Colorado Riverkeeper for his dedication to protect this endangered watershed. The Yampa is the last undammed river in the Colorado River system. Through the years the Yampa has defied many attempts to dam its free flow, several by congress, and the most formidable in 1965 by Mother Nature. Just after dinner on June 10th, a flash flood carried tons of rock down Warm Springs draw blocking the river channel. Within twenty-four hours the Yampa took aim and breached the dam, leaving in its wake Warm Springs Rapid, rated among the 10 biggest drops in the country. In June the Yampa offers plenty of full-bodied waves from the first river day to the last. Like many wild things the Yampa also has a serene side; miles of white tiger-striped walls that drop 2000-feet sheer to the water, side-canyon waterfalls, Ancestral Puebloan rock art, and whispering caves. The river journey will cover 46 miles on the Yampa and then merge with the Green River at Echo Park for a 25-mile run through Whirlpool Canyon and Split Mountain Gorge. Holiday Expeditions is a 36-year-old family-run business based in Salt Lake City, with operational facilities in Vernal and Green River, Utah, as well as Grangeville, Idaho. Rated by the Ultimate Adventure Source Book as one of only two “five-star outfitters” worldwide, the company offers a wide variety of river rafting, mountain biking, combination raft/bike and ranch/raft trips in Utah, Idaho and Colorado, from April to October. During the winter off-season, sea kayaking and whale watching trips are featured in Baja, Mexico. For more information on this special river event along with all of their adventure vacations including a free color catalog, call Holiday Expeditions at (800) 624-6323, or email them at [email protected] You can also browse their web site at www.holidayexpeditions.com. Living Rivers promotes large-scale river restoration through broad-based mobilization. Living Rivers is on the front lines articulating the conservation and alternative management strategies necessary to bring rivers back to life. For more information on their various campaigns and details on how to become a member visit them online at www.livingrivers.org.